The Experience App Editor is a tool on the Showpad Online Platform that enables admins to easily modify the contents of an experience app after it has been uploaded. The interface and structure of the editor is derived from the structure and contents of the config.json file included with your application. 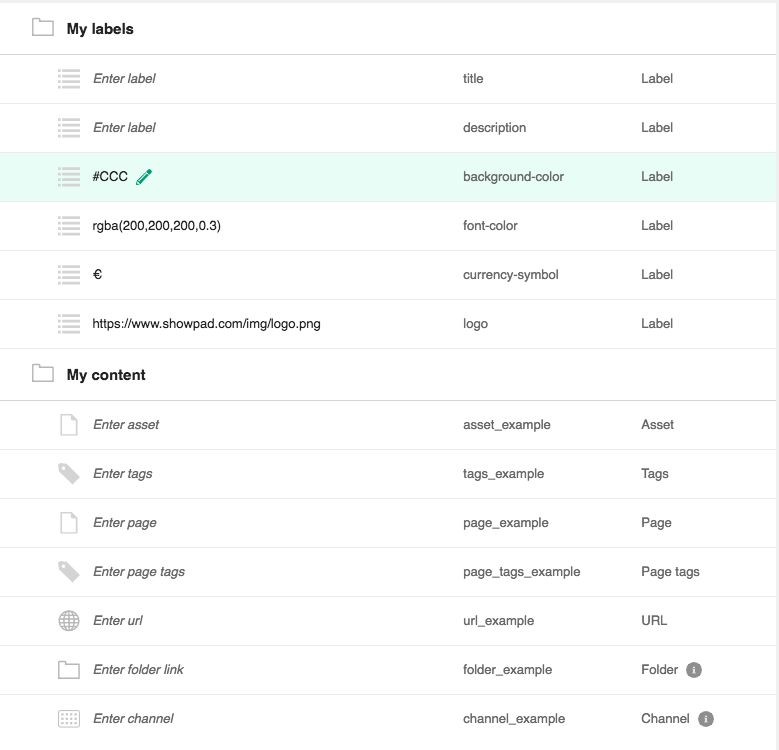 Each content-type defined in your config.json file has a corresponding ui-element in the experience app editor. Each content-type in the config.json has a different type of field in the Experience App Editor. When adding key/value pairs under the “labels” top-level key the values of these pairs become editable as text in the editor. The user is not limited to inserting only plain text content as it is possible to include numbers, hexadecimal colours, special characters (like currencies) and even HTML tags. Content objects can have one of the following content-types: asset, tags, page, page-tags, url, folder or channel. Each of these content-types provides for a different behaviour in the editor. When using the “asset” content-type the editor will display a handy file selector in which the user can select the asset or URL asset they wish to include. When the developer then fetches the config.json in the app, the selected file’s slug will be provided for these selected files. When using the “tags” content-type the user is presented with a way to easily select and combine tags. When using the “page” content-type the editor will display a handy file selector in which the user can select the page they wish to include. When the developer then fetches the config.json in the app, the selected page’s slug will be provided for these selected files. When using the “page-tags” content-type the user is presented with a way to easily select and combine tags. The resulting config.json will then for each tag hold the corresponding slug. The “assets” top-level key will be extended with all the pages that match the given tag queries. The “url” content-type displays as a regular text field in the editor with the added requirement that the provided value is a valid URL. The ‘channel” renders in the editor as a dropdown menu where the user can select a channel to link to. The channels URL will be included in the config.json for the developer to use.